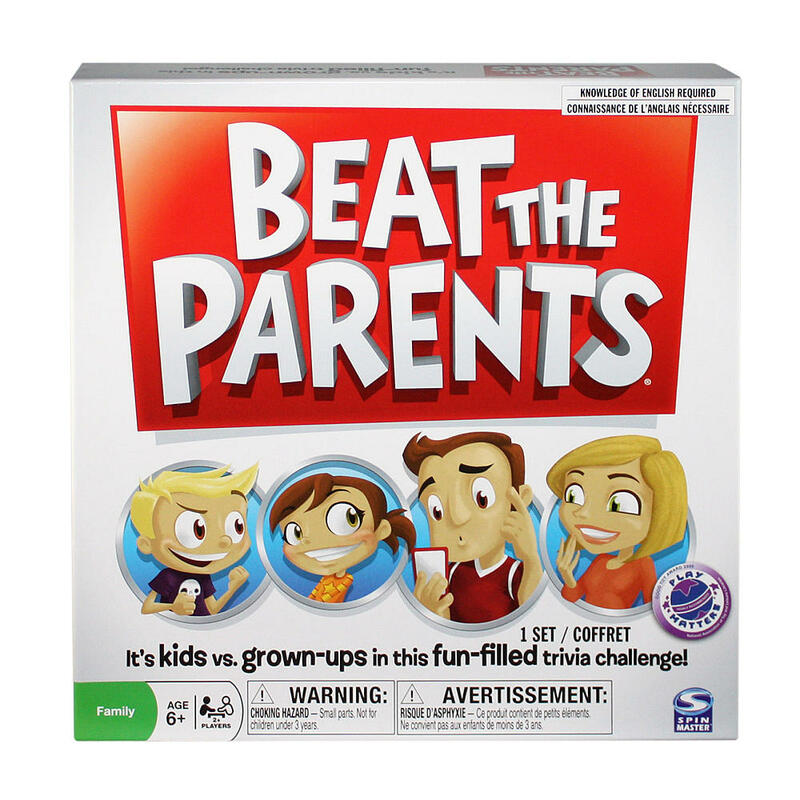 Overview: Beat the Parents is a trivia game that pits kids versus their larger genetic counterparts. Who will be the first to move their pawns across the board to win the game? Beat the Parents Rules–General: Arrange the seating so that the kids are on one side of the playing area and the adults are on the other side. Shuffle the three decks of cards and place them in the playing area. Place four pawns (two per team) on the game board’s starting space. The kids’ team plays first. To begin, adults draw a trivia card from the question cards draw pile and read the first of three questions on the card. If the kids are able to answer the question correctly, they move forward one space on the game board, and the adults move on to the next question. Kids move forward one space for each question they answer correctly, but their turn ends when they are unable to answer a question. Place the used trivia card at the bottom of the deck, and repeat this process for the parents with the kids instead reading from the parents’ portion of the question card. If you land on the same space as another team’s pawn, move it back two spaces. You may only move one pawn per turn and cannot alternate between pawns during a single turn. Pawns may only be moved forward unless bumped by another pawn or if instructed to do so by a wild card. Your turn ends when your pawn reaches the end space, even if you have more questions remaining on your card. Pick up a wild card if you land on your team’s wild card space, perform the indicated action, and continue your turn. Only draw your opponents’ wild card if it is the end of your turn (i.e. you have answered all three questions or you answer a question incorrectly, leaving you on the opponents’ wild card square). Winning the Game: The first team to move both of their pawns to the end space wins the game. If you want to play a shorter version of the game, start both teams with only one pawn.